This Ferry sign for San Francisco measures 36″ in each direction. The sign is simply white with red lettering. There are no illustrations on this sign, just text. 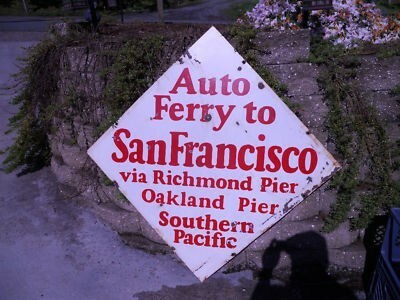 The text reads “Auto Ferry to San Francisco via Richmond Pier Oakland Pier Souther Pacific. The sign is oriented as a diamond.